This is Day 8 of my serialized blog about the Rainblo-Batman Custom Comic entitled “Batman: Born on the Fourth of July”, which I pencilled in the spring of 1994. Each day’s post will include the plot outline, the finished script (when I have it), my roughs, and my pencils. I can’t include images of the pages-as-published as I didn’t receive and have never seen them . If anyone reading this has a copy of the published work, please contact me. If you give or sell me a copy, or send me scans of the published or finished artwork, I will incorporate them into future blog posts. I don’t have plot or finished script for page 8 or 8-1. I vaguely remember the editor, Daryl Edelman, talking me through the plot beats that were necessary to accommodate the “custom” nature of this comic: the only way to own this comic was to send 7 Rainblo Bubble Gum wrappers and $7.95 to Rainblo Bubble Gum, for which the lucky buyer would get this comic book with his or her name and date of birth printed as the clue to the Riddler’s diabolical plot which he gets the idea for on pages 8 and 8-1. “Bobby Jones” is Daryl and my place saver for the name of purchaser of the comic book. This is why I don’t have a copy; Daryl couldn’t comp me and I couldn’t get it together to buy 7 pieces of bubble gum and send in the wrappers. I wanted to post a scan of the advertisement for “Batman-Born on the Fourth of July, but couldn’t find it in my collection. This is probably because I wasn’t buying DC superhero comics during this period; only Vertigo books, which, apparently, did’t carry the ad. By the way, I'm somewhat proud of these two pages, which, hopefully, were printed as as spread. 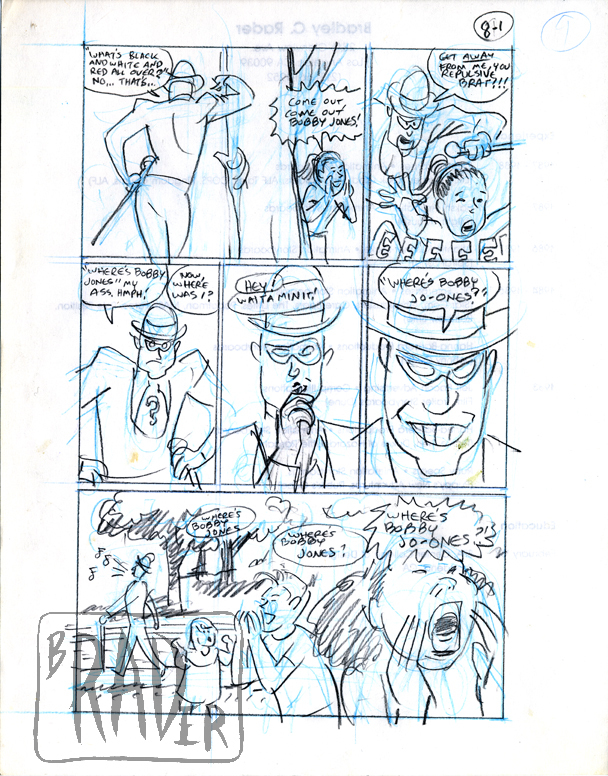 The first panel of Page 8 and the last panel of 8-1 are horizontal panels taking up the width of the page. 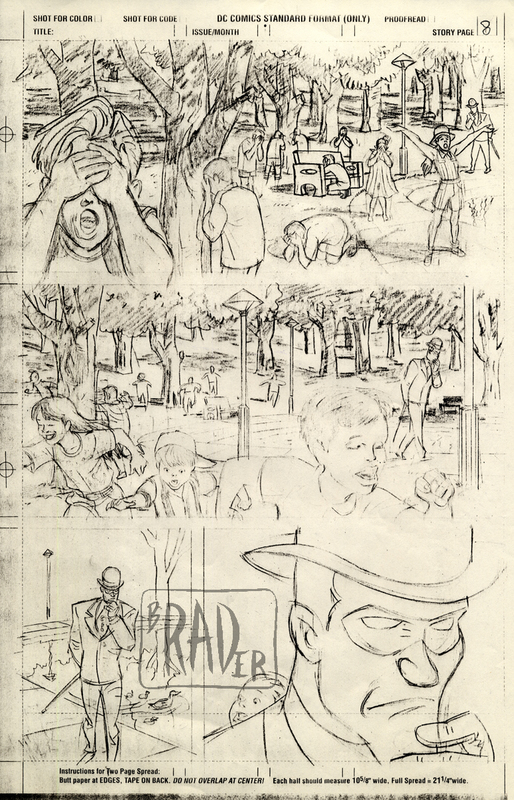 In page 8, panel 1, we start medium c.u. on a yelling kid and "pan" across using the normal western eye-read of left to right to take the reader from close up to distant, across a group of kids covering their eyes,as in a game of hide and seek.. In panel 2 of page 8, the "pan" continues (only now the kids have uncovered their eyes and are in the "seek" part of the game), ending on the distant figure of the Riddler, lost in thought. Thus introduced, the remainder of the two page spread focuses on the Riddler as the idea for his diabolical plan dawns and solidifies. 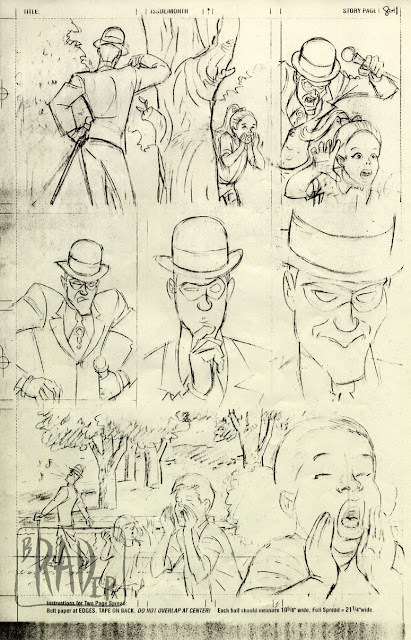 Satisfied, he exits in Page 8-1, panel 6, a reversal of the initial introductory “pan”, from The Riddler’s distant figure to a yelling child in the foreground, panel right. 0scar Edward Cesare, "European PowersConvening"